What game did he win said pig from? The one with the baseballs and the milk jugs? The darts v. balloons one? The one with the water pistols aimed at the disturbing clowns’ mouths? The ‘Sit Through Eddie Money’s Entire Performance’ one? The game where you buy a bunch of ping pong balls and try to bounce them into flowers on lily pads. He bought a bucket and probably on ball 15 he won. He likes the skee ball game where your rolls advance horses, pigs or whatever the theme of the Midway is. He hearts that game, even it makes wee ones cry. cute piggy. does he/she have a name? 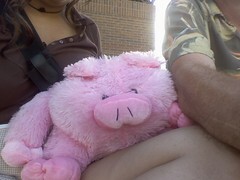 The pig has been named Poindexter, and he’s got a ball and noisemaker inside. We bounce him off the floor and he oinks. Scares the hell out of the cats, which is the best part!